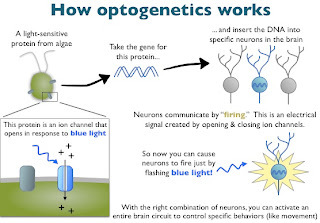 Optogenetics has come in for some stick lately, with a number of people criticising the hype that this technique generates in some quarters. That’s fair enough, I suppose – there have no doubt been some claims made about what can be accomplished with this technique that are, at the very least, premature. I’m all for bashing hype (see The Trouble with Epigenetics 1 and 2, for example), but criticising the technique for what it’s not good for seems to be missing the point to me.